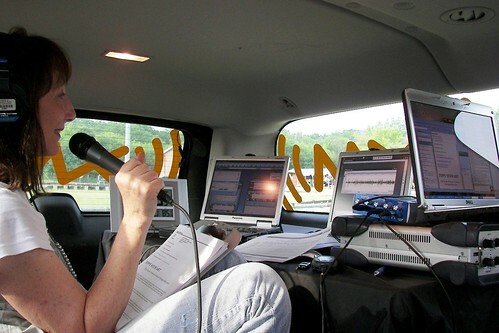 Posted by claireblang in 2008 Season, mobile unit, My Show. Hey Friends! How’s your day going? I am at the XM Studio in New York City – after a 6:15 flight out of Charlotte this morning and wanted to keep you updated on some things…..
Today and tomorrow “Dialed In with Claire B.” will be broadcast LIVE from New York 4-7 p.m. EST on Channel 144 – same time, same place. Friday, I’ll be live in the media center at New Hampshire Motor Speedway 4-7 EST Channel 144 – and all weekend I’ll be covering the first race in the Sprint Cup Series Chase. As always I’ll update this blog with news and will feed breaking news stories to the XM 144 sports updates. NASCAR’s 12 Chase drivers in 2008 will appear at the Hard Rock Café in Times Square today (Wed.) from 12-3:00 p.m. for an event that includes media interviews and interactive fan Q&A to kick off the 2008 Chase for the NASCAR Sprint Cup. Today, on Dialed in I’ll have interviews with the chase drivers, I’ll kick up a little dust and we’ll talk about the chasers visit to the national TV shows, including Letterman! Did you see it? Starting Monday Mad Dog will debut his show 2-7 EST on Channel 144 – and so they have found a new spot for my show on Channel 148 beginning Monday. The time available on that channel is 3-6 EST – so I’ll be an hour earlier and on a new channel starting Monday. More news to come but wanted to let you know of the move. This channel is not a full channel so don’t be surprised when you find it’s just a spot to put this show during this time period. I’ll still be doing updates on XMSN in the mornings in the 6:00, 8:00, and 10 a.m. hour and feeding breaking news to sports breaks. But the show will move Monday so please pass the word. You have all sent me the nicest emails and instant messages and they mean a lot. Part of the reason I chose to stay at XM was all of you and it matters. You have talked racing with me, cheered me on a hard day, and let me into your lives and it means more to me than you will ever know. I am focused every day on how much I owe all of you – I owe you the straight story and not a quick comment, I owe you checking to make sure it’s right and staying unbiased. I owe you going to the track and making sure that when I’m there I am your eyes and ears so that you are a part of all this no matter where you live or what you do for a living. I have never been on the road alone because you have been with me. The truck drivers across America are pretty incredible and you all are woven into what I’ve done like family. You have led me more than once to taking it an extra mile, finding where I am going or honest and well meant friendship and support. No matter where you live or what you do for a living -you have all really been such friends – and such a supportive network that I wanted to say thanks and let you know that I keep that in mind at all times when the days are long or the weather is crazy or things are tough and there are challenges. It’s humbling that when a girl broke the door down doing NASCAR for the first time in national broadcast radio- you all accepted it and treated me fair and I’ll always remember all of you who have been there over the years since the start. I’m headed over to Hard Rock Cafe and I’ll tell you all about it today on Dialed In. I am thinking right now what I can possibly ask these guys that hasn’t been asked yet. I will keep in touch and will blog more coming up soon. This is the place to check for updates and news…..